An electric vehicle is a vehicle that uses electricity for power. It was one of the first kinds of transportation that did not use horse or human power. Electric trains and cars were built in the 1830's. 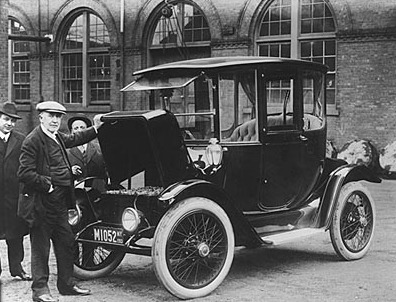 In the early 1900's there were more electric cars than gasoline-powered cars. But cars powered by gasoline or diesel fuel become the most common kind of car for most of the last 100 years. 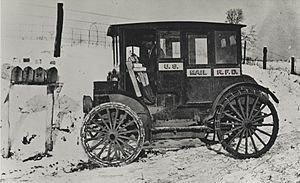 Electric vehicles were always used in some special cases, such as forklifts used inside a building, golf carts, trolley bus or certain vehicles used around airplanes at an airport. Today people are looking at electric vehicles again as a way to reduce pollution and use less gasoline. It is unclear who the first inventor was, but Ányos Jedlik of Hungary built a small model of a working electric car in 1828. In the 1830's Robert Anderson of Scotland, Professor Stratingh of Holland and Thomas Davenport, a blacksmith from Vermont all built electric vehicles. Davenport is said to be the inventor of the DC electric motor. In 1865, Gaston Plante of France made a better battery. In 1886, the inventor Frank Sprague of Connecticut made important changes to the electric motor. Great Britain and France were early leaders in making better electric cars. Interest in the electric car in the United States grew after 1891 when A. L. Ryker built a three-wheeled electric car, and William Morrison built a six-passenger wagon. The years 1899 and 1900 were the best years for electric cars in America, as they outsold all other types of cars (steam, gasoline and diesel). One example was the 1902 Phaeton built by the Woods Motor Vehicle Company of Chicago, which had a range of 18 miles, a top speed of 14 mph and cost $2,000. (At that time, there were few good roads between towns, so most driving was for short distances). 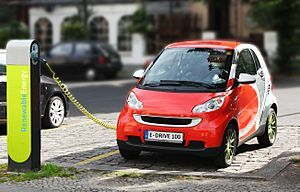 Electric cars could go as far as steam-powered cars and did not take 30 to 40 minutes to get started. Gasoline engines were smelly and noisy. But then the internal combustion engine (that used gasoline and diesel) were greatly improved, and cars that used those engines could go much farther and faster than other cars. 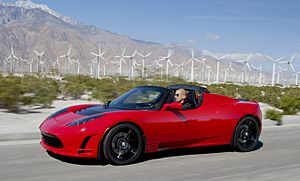 Some people would make electric cars in their garages by taking out the engine and putting in an electric motor and batteries, but for a long time, no big car company made an electric car. Only in the late 1990's did big car companies start making electric cars again. 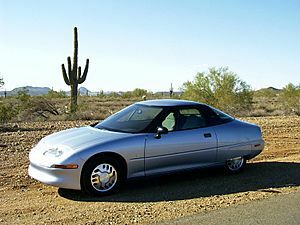 The most famous was the GM's EV-1. Now interest in alternative fuel vehicles is growing. fuel cell - This makes electricity from hydrogen. Hydrogen is very common, but hard to store. It can be made from water, but is usually made from natural gas. solar cell - This uses the power of the sun to move the car. But the sunlight that lands on a car is not enough to make a full sized car move very fast, and cannot work at night unless it stores energy in batteries. Sometimes called a solar car. battery - A battery-electric vehicle (sometimes called BEV) is the most common. The batteries get their energy from an electric supply, sometimes a normal wall plug, like those in a house. A hybrid is a combination of two things. In this case, it is an electric motor, and another type of power. It's not a true electric vehicle. hybrid electric vehicle - Also called a HEV. The Toyota Prius, Honda Insight and other common 'hybrids' are this type. They get their power from gasoline, but can store it in batteries and use it later with the electric motor. So the car has a gas engine and an electric motor. plug-in hybrid electric vehicle - Also called a PHEV. The Chevrolet Volt and the Plug-in Prius are examples. They have even bigger batteries, and can be charged from electric outlets in a house, but also can be powered from gasoline. The gasoline lets you drive farther. human electric hybrid vehicle - Also called HEHV. In the simplest form, this is a battery and motor put on a bicycle. The Twike is a covered vehicle that can hold two people. It can be pedaled, run from battery, or both. There are many other types of electric vehicles. The electric trolley bus uses overhead electric lines to power it. 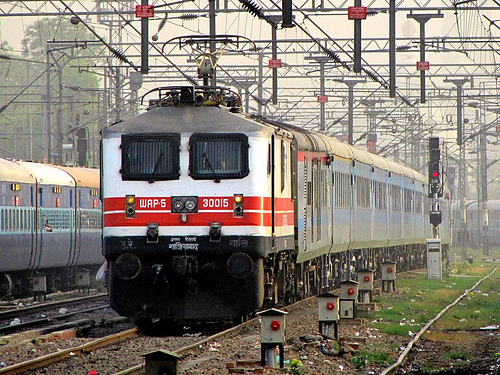 Many trains use a railway electrification system to supply power. A few high-speed rail lines use powered magnets in the track to move the train, in a system called 'mag-lev' (magnetic levitation). 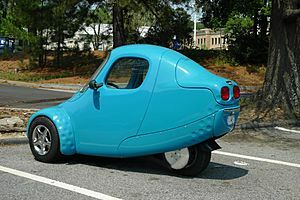 There are electric bicycles and motorcycles and some tricycles (trikes) like the Corbin Motors Sparrow, which was also seen in the Austin Powers movie Goldmember. 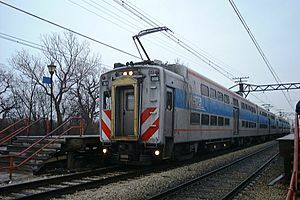 Most freight trains are diesel-electric. The locomotive has a diesel engine which provides electricity, and an electric motor which makes the wheels turn. Advantages: These vehicles use an electric motor, so they are very quiet, no smell and no pollution from exhaust gases. They can even be used indoors. Oil for gasoline and diesel is a limited resource - it will not last forever and is becoming more expensive. If the electricity for a battery-electric vehicle comes from a renewable energy source, like a windmill, solar cells, geothermal or hydroelectric, then it will not produce as many global warming gases. Disadvantages: Batteries do not store a lot of energy, and they are large and heavy, so the vehicles usually cannot go very far. It takes a long time to recharge a battery, sometimes many hours. Good batteries can be very expensive, and all batteries need to be replaced after a while. Most electricity in the United States comes from coal or natural gas, so an electric vehicle that is powered by electricity from one of these plants will still add to global warming gases. The world's two best selling all-electric cars in history are the Nissan Leaf (left), with 240,000 global sales through September 2016, and the Tesla Model S (right), with over 150,000 units delivered through November 2016. 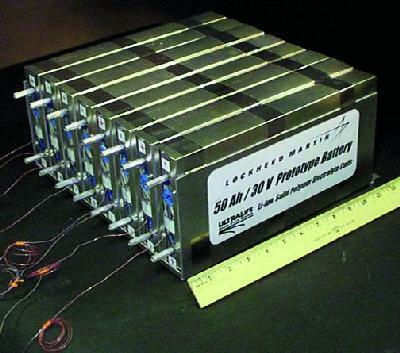 75 watt-hour/kilogram lithium ion polymer battery prototypes. Newer Li-poly cells provide up to 130 Wh/kg and last through thousands of charging cycles. Electric vehicle Facts for Kids. Kiddle Encyclopedia.